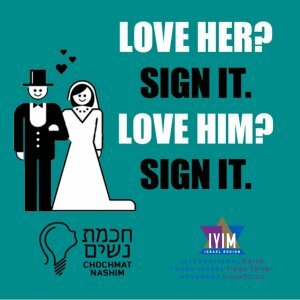 In order to be legally valid, the Agreement must be signed prior to the wedding before a notary or the marriage registrar in the Religious Council’s office or the Regional Rabbinic Court or the Family Court. Three copies should be made at the time of signing: The marrying couple should each receive one copy; the authorizing body should receive the third copy. 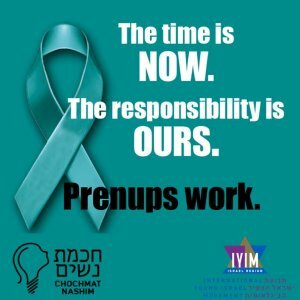 Please note for your information that the composers of the prenuptial agreement cannot take upon themselves legal or halachic (Jewish legal) responsibility for the phrasing and text of the agreement or for its validity. Rabbinic and Halachic authority and/or legal authority (an attorney), of your choosing, should be consulted in order to obtain appropriate counsel and advice. **The Council of Young Israel Rabbis in Israel (now IYIM – Israel Region), in cooperation with Rabbi Yonah Reiss and Rabbi Prof. Michael Broyde – both of the Beth Din of America –translated the “Agreement for Mutual Respect”, developed for use in Israel, into English. An additional clause has been included which assigns jurisdiction to the Beth Din of America [as an arbitrator] should either of the parties not reside in the State of Israel, or should the agreement not be deemed enforceable in the jurisdiction that the parties reside. The agreement, including this clause, has been translated into Hebrew, Russian, French and Spanish. All are presented below, as well as a Hebrew version including the additional clause. Which version do I sign? For couples residing in Israel it is recommended to use the Hebrew version. ** Draw a line through the entire Clause “Financial and Custody Issues”, in effect crossing it out. Make three sets – each set to include a) the Heskem L’Kavod Hadadi on top and b) the Beth Din of America’s Binding Arbitration Agreement on the bottom. Notarize – sign all three sets at any notary. There will be a standard notary fee. The marrying couple should each receive one copy; the notary should receive the third copy. Available in 4 colors and ready for print! The increased utilization of pre-nuptial agreements is a critical step in purging our community of the distressful problem of the modern-day Aguna and enabling men and women to remarry without restriction. The Agreement for Mutual Respect is a prenuptial agreement for the prevention of get-refusal*. 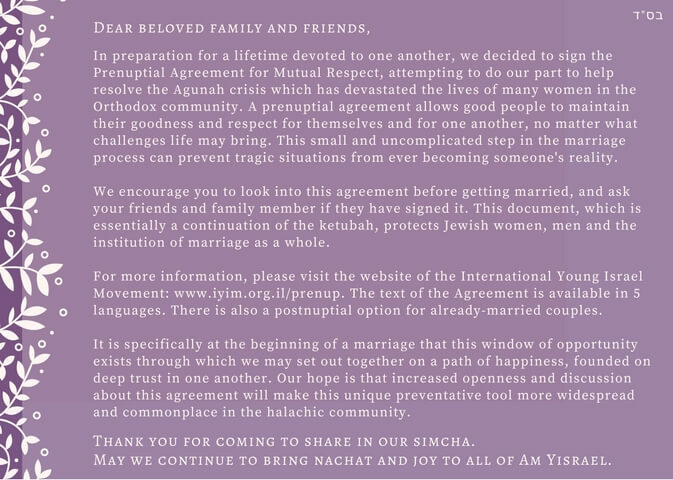 The Agreement anchors modern day’s philosophy of partnership and mutual respect in the context of Jewish law, thus it has been signed and ratified by thousands of couples in Israel. A year later, in 1994, “The Endorsement of Prenuptial Agreements” was reaffirmed. In May 2006, the Rabbinical Council of America once again reaffirmed its previous resolutions, declaring “that no rabbi should officiate at a wedding where a proper prenuptial agreement on get has not been executed”. * Dr. Levmore’s extensive research on the subject of Prenuptial Agreements for the Prevention of Get-Refusal has been documented in her book in Hebrew Minee Einayikh MeDim’ah: Heskemei Kedam Nissuin L’Miniyat Seiruv Get, 2009.